Time to start getting ready for trips. The first was the carrier for my stove fuel. On my last road trip, I carried it inside my side cases. There is some risk associated with that especially when things got really warm. I had picked up this Touratech carrier a couple of years ago but never installed it. Very well made and came with stainless mounting hardware. 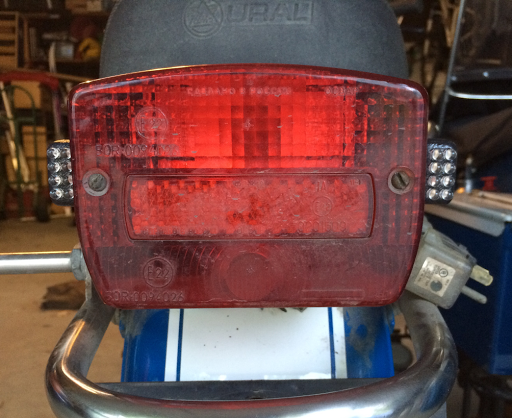 I also installed the Hyper-Lites that I had picked up in Anchorage last week on each side of the tail light. They have a "California" option which blinks for 5 sec then are on steady. I prefer that especially if I'm following someone. I would find continuous blinking at a stoplight annoying. 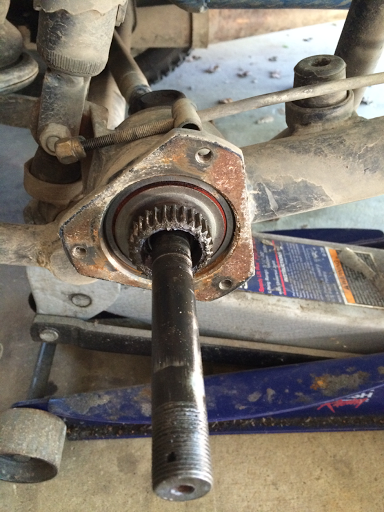 As part of the 27,500 km maintenance, I removed the front wheel to adjust the wheel bearings. 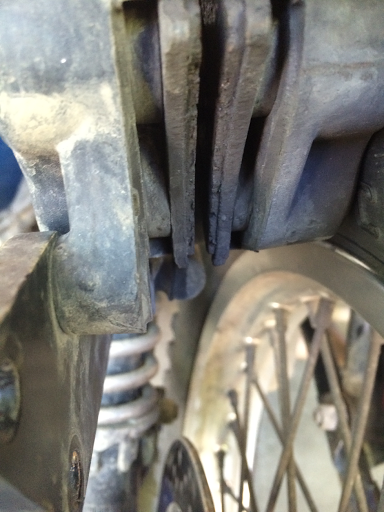 They didn't need adjustment though I did notice that I need new front disk brake pads. They have been ordered and hopefully get here before Thursday. One last task was removing the stub axle from the sidecar. Here is the axle with the wheel and brakes removed. The "unofficial manual" says to just put a block of wood on the end of the axle and pound the stub axle and inner bearing out of the housing. Easier said than done. After more than a bit of pounding, I stopped as I didn't want to damage the bearings. Since I can't get a picture of the worn axle splines without risking the rig being down for an extended time, I'll just order the parts and fix it when I get back. Not try to do a claim on the extended warranty. BTW, this post was made using BlogTouch Pro on the iPhone. I've remove the axle stub perhaps twice in my ownership of URALs and it always required a bit of pounding as indicated in the unofficial manual. I do understand the reticence however. Not sure which splines you're worried about though....the picture you posted shows them a bit worn (hard to tell) but still usable it seemed to me. It's the splines on the stub axle itself that engage on the inside of the collar with the splines that engage the wheel. With the collar held in position, the drive shaft can be rotated almost 20°. Normal movement may be 1°. On the BMW, the camp fuel was inside the side case which is about an inch or so above the muffler. It never got warm enough to melt anything but there were times when things inside the case were almost too hot to handle. For me, too hot for gasoline. I’ve used Touratech’s holders for about 4 years, and the setup stays snug, even after miles of relentless washboards. Also, it leaves more space in the cases for other gear. Did your carriers include adhesive, rubber bumpers? Yes they did. I placed them so the aluminum bottles don't touch metal. Is that what they're for? I've always just carried a couple of liters of water in a Camelback clone inside of my tank bag. On the BMW, I never carried extra fuel as it had a 240 mile range without the sidecar. The Ural has two NATO 2 1/2 gallon cans though I plan on using one plus a Kolpin 1 1/2 gallon (EPA/CPSC Compliant) on my upcoming road trip. I'm told that CA prohibits the use of gas containers such as the NATO cans so I'll leave them elsewhere. 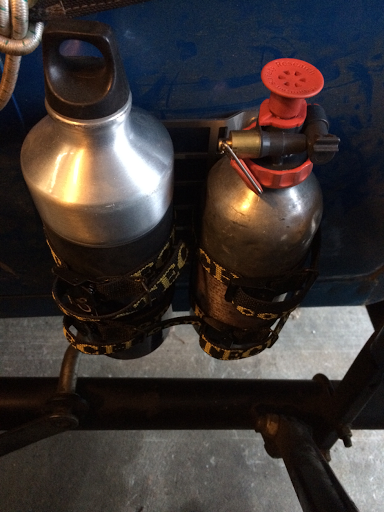 I followed a tip online and secured a fuel bottle under the rear rack using a couple of large pipe clamps, the stainless steel strap type with the worm screw tightening mechanism, but with plastic butterfly screw tops rather than simple slotted screws. Works well. Also cheap. The BMW didn't have anywhere handy for the fuel bottle, and I may be getting a different fuel bottle as I don't want to carry the stove pump unprotected from the elements.